A recent study looked at runners suffering from patellofemoral pain syndrome (PFPS) and following a 3-week hip-abductor muscle-strengthening program. The research looked at changes in strength, pain, and biomechanics between patients suffering from PFPS and following the 3-weeks hip-abductor muscle-strengthening program versus with patients not following the 3-week program. After the 3-week hip-abductor muscle-strengthening program, the PFPS group demonstrated increased strength and less pain. This research concluded that hip-abductor muscle strengthening should be incorporated into PFPS rehabilitation. A number of authors have already hypothesized that a primary contributing factor of knee pain with people suffering from PFPS is weakness in the hip-abductor muscles. Researchers have found that people suffering from PFPS exhibit strong hip-adductor muscles in comparison to the hip-abductor musculature. This is in fact another example why when treating an injury a therapist must look at the whole picture. 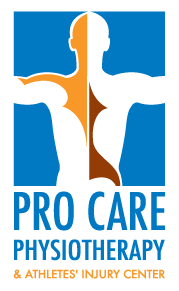 Here at Pro Care Physiotherapy & Athletes’ Injury Center our physiotherapists do not only treat the injury itself but also the cause of the injury, in order to reduce the chances of recurring injuries.